Whether you are pregnant, a birth medical or non medical caregiver, post partum doula, baby nurse or teacher, during the winter months, immune systems are compromised and there are concerns with flu pandemics. Pregnant women are more vulnerable because their immune systems are suppressed during thepregnancy so that their bodies don’t reject the baby. Three things that can’t hurt and may well help: Vitamin D-*3*, up to 10,000 IUs a day if the flu is coming on. Otherwise, 2,000 – 4,000 daily as a preventative. Vitamin D is not given in milligrams, but in IUs, which is a much smaller dosage. 250mcg or micrograms is equal to 50 IUs or international units. A microgram is 1/1000 of a milligram. The normal dosage of Vitamin D is about 2000 IUs. Vitamin C, which most people are already taking in their prenatal vitamins, but maybe a larger dose of 2,000-5,000 mgs. per day. Vitamin C is water soluable so you will pee out whatever is too much for the system. Also, if you are taking too much your body will let you know through loose stools. Do not take anymore that day if this happens. Or, give your body a break and take some later during the day or night. Resveratrol (that’s the good stuff in red wine) at about 250 a day. “…Cannell has reported on Sept 16 in his newsletter that two physicians, one in Wisconsin and the other in Georgia, suggested that vitamin D supplementation can be the key to H1N1 flu prevention. Not to be too obsessive about this, there’s also hand sanitizer, which is a really good idea. A little bottle in your purse, and then use it whenever you’ve been out anywhere. Most drug stores have the little bottles right by the check-out counter. Another thing to do that can help to keep you healthy is nasal gavage. Use a Neti Pot once a day – every day. If you are around someone ill go home and use it. Many doctor’s particularly ENT’s for eye, ear, nose surgery comment, if all their patients used this every day they would be out of business. It helps to rinse all the allergens and germs out of your nasal passage. Learn about it at a local health food store or here online: http://www.youtube.com/watch?v=j8sDIbRAXlg or http://www.youtube.com/watch?v=t8KOsNtpV8w. It works great! But one caution – you need to use 1/4 t. of sea salt and 1/4 t. baking soda. If you don’t use the baking soda it burns like crazy – the baking soda acts as a buffer. Clean your nostrils at least once every day with warm salt water. Not everybody may be good at Jala Neti or Sutra Neti (very good Yoga asanas to clean nasal cavities), but blowing the nose hard once a day and swabbing both nostrils with cotton buds dipped in warm salt water is very effective in bringing down viral population. Other ‘nasal washes’ you might look into are: NeiMed Sinus Rinse which one of my pregnant woman says is inexpensive and she uses it in the shower. 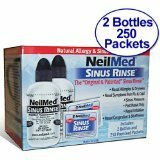 Get it at a local drug store or online at: http://www.amazon.com/NeilMed-Sinus-Rinse-Regular-Bottle/dp/B000RJGB5C/ref=sr_1_3?ie=UTF8&qid=1256842484&sr=8-3-fkmr0. the nasal cavity. The result is an elegant new way to keep your nose clean. It’s easy to use, convenient, comfortable and safe. And it doesn’t make a mess! Please join us on the road to better nasal health starting today, and begin to enjoy immediate sinus relief along with the lifelong benefits of superior nasal hygiene. Cover your mouth and nose with a tissue if you sneeze or cough. Avoid travel. If you have any symptoms, stay home. If your symptoms are severe, immediately contact your healthcare professional. © 2009 Midwifery Today, Inc. All rights reserved. Neonates and infants younger than 6 months of age are at risk for complications from seasonal influenza and presumably 2009 H1N1 influenza (swine flu), although the morbidity and mortality from this new virus have not yet been described. While the advantages of breastfeeding are well-known, this close interaction of mother and newborn also can facilitate transmission of influenza virus. The benefits and the risks of close contact must be considered carefully. • Pay careful attention to handwashing prior to any contact. • The mother should wear a surgical mask to prevent nasal secretions and the spontaneous cough or sneeze from inoculating the infant. • Use clean blankets and burp cloths for each contact. • Monitor the maternal-infant interaction on perinatal floors for compliance with the above precautions. • Gargle twice a day with warm salt water (use Listerine if you don’t trust salt). *H1N1 takes 2-3 days after initial infection in the throat/ nasal cavity to proliferate and show characteristic symptoms. Simple gargling prevents proliferation. In a way, gargling with salt water has the same effect on a healthy individual that Tamiflu has on an infected one. Don’t underestimate this simple, inexpensive and powerful preventative method. • Drink as much of warm liquids (tea, coffee, etc) as you can. *Drinking warm liquids has the same effect as gargling, but in the reverse direction. They wash off proliferating viruses from the throat into the stomach where they cannot survive, proliferate or do any harm. These precautions are designed to minimize the risk of transmission until mother’s immune response to H1N1 influenza is established, and increased, specific immune protection may be provided by breast milk. Note that influenza virus does not pass through breast milk. Although the most effective way to prevent influenza transmission is complete separation from her infant when a mother is receiving antiviral treatment, separation may create more long-term problems in breastfeeding success and mother-infant bonding than any potential benefit achieved from avoiding infection in the newborn infant. For any mother with H1N1 influenza infection who presents in labor to a health care institution, testing and empirically starting therapy for influenza with an antiviral is suggested. Oseltamivir (Tamiflu) or zanamivir (Relenza) will hasten resolution of symptoms and infectivity, particularly if treatment is started within 48 hours of onset of illness. Neonatal exposure to oseltamivir (Tamiflu) excreted in breast milk is extremely low. Immediately following delivery, the precautions listed above should be instituted as the newborn infant is first placed into mother’s arms. These precautions should be followed until mother’s illness is resolved, i.e., no fever, as measured without antipyretics, for 24 hours. While no data exist to support these suggestions, it is believed that these represent an appropriate balance between the benefits of mother-infant interaction and the risks of serious neonatal infection. Institutions may wish to modify of these suggestions to address their needs and medical practices. Dr. Lawrence is chair of the AAP Section on Breastfeeding executive committee. Dr. Bradley is a member of the AAP Committee on Infectious Diseases. It is very important that you do your OWN research. Don’t let anyone tell you what to do. This is your body, your life, your children and it is important what ever you choose to do, not to judge someone else for their choice. We are here to learn to agree to disagree. Everyone’s level of development, fear, trust and preventative abilities is different. Don’t just do something bacause someone says it’s the best thing to do. Assume your power by gathering knowledge, going inside and making an informed choice. This entry was posted on Wednesday, October 7th, 2009 at 11:07 pm	and is filed under Flu Vaccine Conversation. You can follow any responses to this entry through the RSS 2.0 feed. You can leave a response, or trackback from your own site.